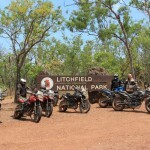 The Top End tops all for its wonder and beauty, and there are few better ways to see it than on a motorcycle with people who know all the top spots. A road map of the Northern Territory looks like the easiest thing in the world. One straight line runs top to bottom and another straight line heads for Queensland, as if fleeing the monotony. The road we were on, though, flowed from turn to turn, rolling up over crests and down into dips, one after another. I’d been forced to dial the BMW’s electronic suspension up to sporting mode. This was great fun! Like most Top End virgins, I’d underestimated the place, in spite of all the info and images beamed out of this huge and exotic part of Australia. I probably hadn’t paid too much attention, waiting for that one day when I’d get a round tuit and see the place for myself. Now, seeing it up close and personal, I finally realised how much the NT does not resemble the emptiness implied by the maps. A bit of fun on a rare sandy stretch: short but sweet! 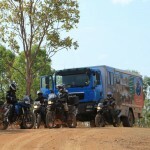 The tour’s crew along with the South Cross Motorbike Tours backup truck … an awesome rig! I flicked the 700GS over onto its right side and held it there through a long arc, following Greg Murdoch towards Adelaide River. We were getting towards the end of the tour and I was only beginning to understand the Territory, or at least the splendour of Kakadu National Park and some of its nearby attractions. It seems that the trick to enjoying the area is knowing where to go and how to get there. 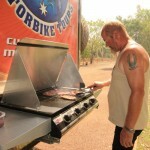 The routes we took were often lots of fun because Greg, owner of Southern Cross Motorbike Tours, knows the best rides. The places we went covered the whole gamut: iconic outback pubs, historic towns, WWII relics, Aboriginal culture, amazing scenery and, of course, the unbelievable nature that thrives up here. 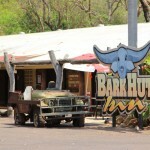 The Top End is all about the details, something that no map can convey. Having said that, you often don’t get any sense of the vastness of the place as you ride through the low eucalypt forest that dominates so much of the landscape. From the air, it’s a very different story. We went for a flight over part of the park, aware of the fact that even from way up there we couldn’t see the lot. We flew over the western end of the escarpment that stretches beyond the horizon to the east. This is what they call Sandstone Country, a rough and jagged landscape containing many sacred sites. The plane buzzed past 300m high cliffs glowing in the morning sun. We passed the spot where Aboriginal Dreamtime legends say the Lightning Man, or Namarrgon, sits to watch for storm clouds he can light up. Further on, the Rainbow Serpent sleeps under the base of another tall, distinctive cliff. Just opposite — right out the windows on the other side of the plane — the Jabiluka uranium mine made a strange sight. Compared with your back yard, it’s an enormous hole in the ground with an even bigger rectangular lake beside it, though in the big scheme of the national park it’s a minor blemish. I’ve not often been one to take the flights, cruises and other alternatives means of seeing things when I’ve been away of the bike. An evening flight over the Painted Desert and flooded Lake Eyre a couple of years confirmed I’ve been a dill to ignore them, and this one over Kakadu was well worth it. You not only see more, you learn things. We swooped over a billabong not marked on maps so that it kept off the tourist radar so the traditional owners can enjoy a bit of private space. 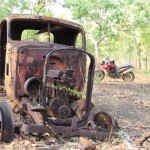 Not far from its banks were the remains of a failed pine plantation which had subsequently become Kakadu’s first real tourism venture as a hunting camp. That too folded. The day after the flight, we rose early from our beds in Cooinda for a cruise in a mega-tinny on Yellow Water Billabong. We hadn’t pulled away from the jetty when the first croc appeared, only its eyes and snout protruding from the water as it waited motionless on the edge of the reeds. Egrets, spoonbills, whistling ducks, white-bellied sea eagles, crimson finches, azure kingfishers and god knows how many other birds flew, floated or perched all around. Further on a huge flock of pelicans patrolled for food, all inverting themselves in unison to forage on the billabong’s bed. 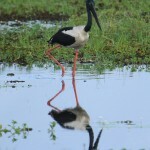 The real prize for the birdwatchers, though, were the jabiru, one of the most elegant and beautiful birds you’ll ever see. 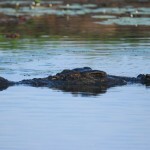 My favourite, though, was the 4.5m crocodile that cruised past a metre from the boat, completely unconcerned by us. Salties are an awesome beast, especially up close. They don’t have much sense, though. I had to laugh as a smaller croc drifted directly into the path of our big flat-bottomed boat. You could almost see it thinking, “wow, that’s big,” as we closed on it, but it didn’t think to get out of the way. Clunk! No harm done. The guide had earlier told us how small a croc’s brain is. “For its body size, it’s the smallest in the animal kingdom,” she’d said. “Sounds just like Mark,” said Noel Humphreys of his good mate. He and Mark Graham were always taking the piss out of each other during the trip. “But it’s incredibly cunning,” continued the guide. “Nah, doesn’t sound like Mark at all,” Noel said, loud enough to get a laugh from everyone around. Mark scowled and plotted his revenge. Back on land by about 9am, we were already a little sweaty as we pulled on the riding gear again and fired up the BMWs for another day in paradise. I wasn’t expecting great riding for the first little while, having seen the long ribbon on tarmac from the plane. I looked forward to a bit of alone time in my helmet, only I didn’t get as much as I thought. 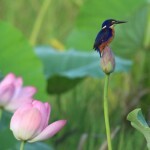 Even on the transport sections, Kakadu has lots to keep you interested. It’s amazing what you sometimes see through the gums and low scrub — brumbies grazing, some of them jet black, other paint; wallabies bounding through the bush (sometimes uncomfortably close! ); smoke rising from fire-blackened areas after the managers had been patch burning. You’ll always encounter some fires, because they burn about a third of the country every year. The sweet smell of recent burning was sometimes enhanced by the first tentative showers of the impending wet season. As modern Australia is slowly realising, there’s great benefit to be had from managed burning of our land, but that’s something the Aborigines knew intimately, if not necessary so scientifically, for thousands of years. You get a sense for the long human presence here when you visit the Ubirr rock-art galleries. A nearby visitor centre, which is as much a museum, gives a detailed view of Aboriginal life and heritage but the paintings on the rocks are stunning. We walked through them reflecting on the stories, lessons and beliefs they represent to one of the world’s oldest cultures. The Lightning Man was painted on one wall, and I enjoyed my mental image of him sitting on his rock — the one we’d seen from the plane — and getting excited every time a good cloud appeared on the horizon. Greg was by getting pretty excited about a place called Gunlom, our lunch stop after the galleries. 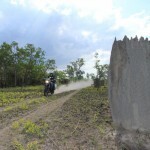 We cruised a while on tar then onto a sometimes gravelly dirt road before hooking left onto the only really crook road of the whole trip, the last 11km to Gunlom. Every pothole was worth it — we arrived at the giant waterhole, stripped off our riding gear and headed for the clear water. “No, they don’t often find crocs here,” said Brian Haynes, our tail-end rider, as we walked past an ominous warning sign. “They’d have to come over the falls or walk up the creek.” Half a dozen people were already swimming, none being pursued by man-eaters, so we plunged in. The bliss matched the sheer beauty of the setting. Greg and Jude slaved over the barbie in the high-30s heat as we cooled off. I didn’t want to get out. 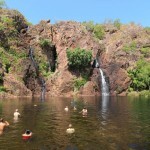 We’d repeat this experience in Litchfield National Park just before winding up the tour in Darwin, but Gunlom is that much bigger and less frequented that it was without doubt the highlight. Greg copped a flat on the way out, and while we fixed it we spied something through the trees. Turned out to be a 60-year-old hut left behind from the days they worked this place. The remains of an ancient truck indicated what a hard life it’d been in such an extreme climate and remote place. Grove Hill, which is little more than a dilapidated tin shed that still operates as a pub, gives more insight into life here in the old days. The shed is full of rusty, cobwebbed souvenir of a bygone era, including a bedroom complete with wire-framed beds to provide an idea of how things were. Tough industries like cattle, crocodiles, buffalo and mining brought hard men and women out here, and things certainly didn’t go well for all of them. But fortunes were there to be made, too. At Pine Creek we walked through old gold mining machinery including some steam engines that ran it as well as horse-powered set-ups. There are dozens of old mines around here and a number that still produce gold. If you’re into historic railways and trains, Pine Creek’s got the goods, too. The other side to the NT’s history is the Second World War. The place teemed with Aussie and American soldiers, and Darwin was the main, but certainly not only, target for numerous bombing raids by the Japanese. Greg led us around Darwin in a brief tour of some WWII and other landmarks before we headed to Kakadu, but after the trip I spent a while exploring it more closely. The Military Museum is brilliant, really bringing home the impact of the attacks. 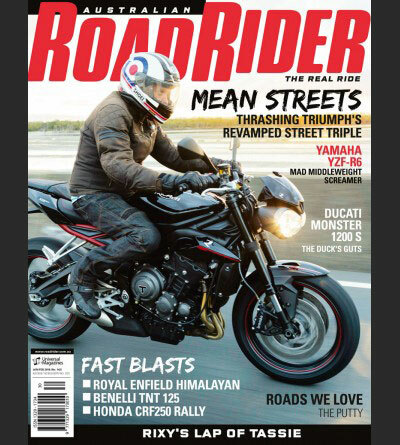 No, better to be touring Kakadu on a motorcycle. We headed on for a while until the tar seal ended and a wide, flat strip of reddish gravel led us on to the next little piece of Top End paradise. I turned off the BMW’s traction control and let the back end drift a little in the long sweepers. Between the bends I relaxed and watched the not-quite-familiar flora of this tropical savannah pass by, losing myself in my own thoughts. One thing I love about following a guide is not having to do any more thinking than that. Later, chasing Greg on that fun tar road leading us to Adelaide River, he put his left indicator on, heightening my sense of anticipation about what was coming next. We turned up a gnarly little track that rose steeply to a hilltop looking back over the floodplains. The humid air blurred the far-off horizons and softened the colours, though there wasn’t much it could do to overcome the intensity of the greens. That’s when I knew I’d have to come back. My taste of Kakadu had whet my appetite for it, and now I wanted to see more of it, to experience something of the Wet and to ride more of these roads. There is so much here, and I regretted not having seen it earlier. Better late than never. In fact, now it’s so easy to visit on a bike, my timing might have been perfect. 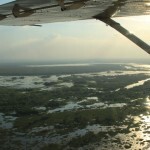 Kakadu is closer to most of us than it’s ever been. 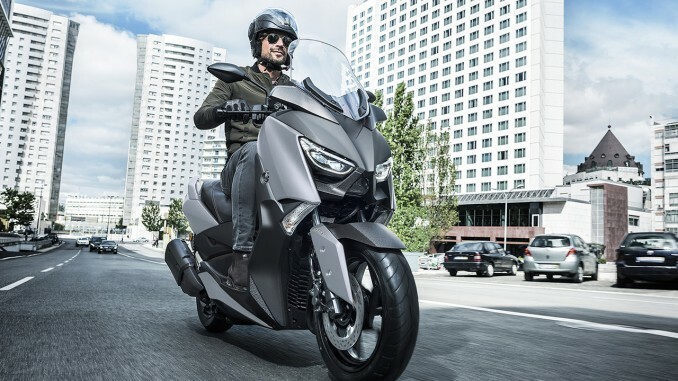 Riding the Top End has always been challenging because you had to ride so far just to get there, but now that Southern Cross Motorbike Tours has set up shop, you can fly in, ride and fly out again within a week. Which is exactly what I did. SCMT lays on the bikes, route, logistics and support on set trips or tailored ones. Greg and Jude Murdock have a heap of options for you, depending upon how long you’ve got, how adventurous you are and what you’d like to see. They’re also taking SCMT beyond the Top End. They can take you through the Red Centre, through the eastern states and even around Tassie, which is their choice during the Wet up north. For obvious reasons. 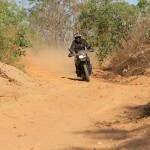 One 10-day itinerary offers both riding and fishing, in either the Kimberley or Arnhem Land. The SCMT truck is a full-on Dakar-style rig that can tackle any of Australia’s outback treks. Greg confirmed that’d he also look at providing support to groups that wanted to take on challenges like the Canning Stock Route or Anne Beadell Hwy. You can find out more at SCMT’s website or call (08) 8985 1681.